Having completed a week or so of Couch to 5K, I bought myself some running shoes. I told my brother about my adventures and he recommended I use Endomondo to track my runs. Being a data nerd and believing that you can’t improve what you can’t measure, Endomondo appealed to me. It also gave me regular feedback on a run as to how far I’d travelled and at what pace. By the end of March, I’m able to do 4.29 km in 33m:41s. Nearly there! I’ve also switched from running in the evening to preferring early morning runs. Towards the end of the Couch to 5K I was still doing just four-point-something kilometres in a session, never quite reaching the target. Rather than get frustrated by this, I just kept running past the end of the programme. On 8 April I did an extra lap of the local high school grounds to clock up 5.18 km and felt pretty happy. I completed the distance twice more that week to prove it wasn’t a fluke. The following week, I clocked up 6 km in about the same time I’d run my first 5 km. Not speedy, but getting faster! On Easter Monday I headed out for an early morning run before Kirsty and Eamonn were awake. I couldn’t find my earphones and decided that rather than wake them up tearing the house apart to find the earphones, I’d try running without them. I’d heard that people run better without music. All I could hear as I ran along my usual route was the wheezing of an old bloke who’d overindulged over the long weekend. It was horrible and I vowed never to run without music again. For most of the Couch to 5K, Kirsty had been on at me to sign up for a run, the Mother’s Day Classic. The MDC includes a 4km and an 8km run around Melbourne’s iconic Tan Track. I can comfortably run 6km, so faced with the choice, I opt to stretch for 8km and book my place on 22 April for the run on 11 May. I start training the next day and the day after that, I rode to work from our home in Coburg for the first time (expect a cycling post sometime this year). Looking back, having an iPhone app that can get a geek out from behind a computer screen and running 6km from nothing in the space of a couple of months is amazing. I bet Steve Jobs never envisaged that when he launched the device and the App Store! Cycling to work and back on a Wednesday seems to be helping with my fitness and I’m finding the running a little easier. On my fifth training run I made the 8km distance and I’m happy that I’ll be able to run the MDC without keeling over. There’s the Anderson Street Hill to consider, but how hard can a hill be, eh? It turns out… it is hard! Race day came around quickly and I’m standing near the start line in Alexandra Gardens. I’d got there very early, because it was my first running event and I had no idea what to expect. I’m wearing my race number (11564) and have some new tunes lined up to listen to on the clockwise circuit. I’m not sure whether I’m nervous or excited. My friend Ross’ advice was echoing in my ear, “There will be marathon runners: don’t try to keep up with them and go at your own pace. And speed up when you get to the hill”. Music is pumping near the start line, and then we’re off! I ran as hard as I could and, having started near the front, people are absolutely whizzing past me. Before I knew it I was halfway up Anderson Street Hill and I feel like every blood vessel in my body is about to explode. I don’t hear what Endomondo says my pace was at the end of the first kilometre, but it started with a five: I’d never heard that before. I took my right earphone out and I can hear lots of fellow runners pounding away at the pavement and I don’t seem to be wheezing the most. I can do this! The second lap was much much harder. I kept as far to the left as I could manage as I climbed Anderson Street for the second time. It felt like Everest and I wanted to give other runners as much space as I could. I was struggling to put one foot in front of the other and was hugely relieved to reach the summit. According to Endomondo’s graph, my pace dropped to 11:33 min/km… I walk faster than that! I was so pleased to reach the finish line three kilometres later. I only ran once more that month and it wasn’t even 5km. For the first couple of weeks of June I’d not even put on my running shoes. After completing the Couch to 5km and the MDC I think I’d lost motivation. I went in search of some targets and found The Run Melbourne was in about a month’s time and had a 10 km run. If I can do 8 km, I can do 10 km, right? I’d registered for parkrun back in May but had never actually attended a run. I decided that it was time I found out what all the fuss was about… it would serve as good training for my next event. There are were a few parkruns around Melbourne but I chose Westerfolds parkrun as my first run. Westerfolds parkrun was a lot more relaxed than the MDC. The organisers were welcoming and friendly and so were the runners. The course is lovely, too: there are beautiful views, flora and fauna. Sometimes I see kangaroos hopping around as I run there. Westerfolds Park has become my favourite place to run in Melbourne. Somebody recently described it to me as “The Bathurst of running”. My weekly parkruns have become the heartbeat of my running schedule and my fellow parkrunners have become good friends. My friend Gary introduced me to Strava in July. Strava is a lot like Endomondo but has even more data (for nerds like me) and more of my friends are on it. I said before that parkrunners are friendly, they’re also very encouraging; I don’t think I’ve done a run yet where a fellow parkrunner hasn’t given me kudos on Strava. It has become my favourite tracker (but I haven’t locked myself into just one). 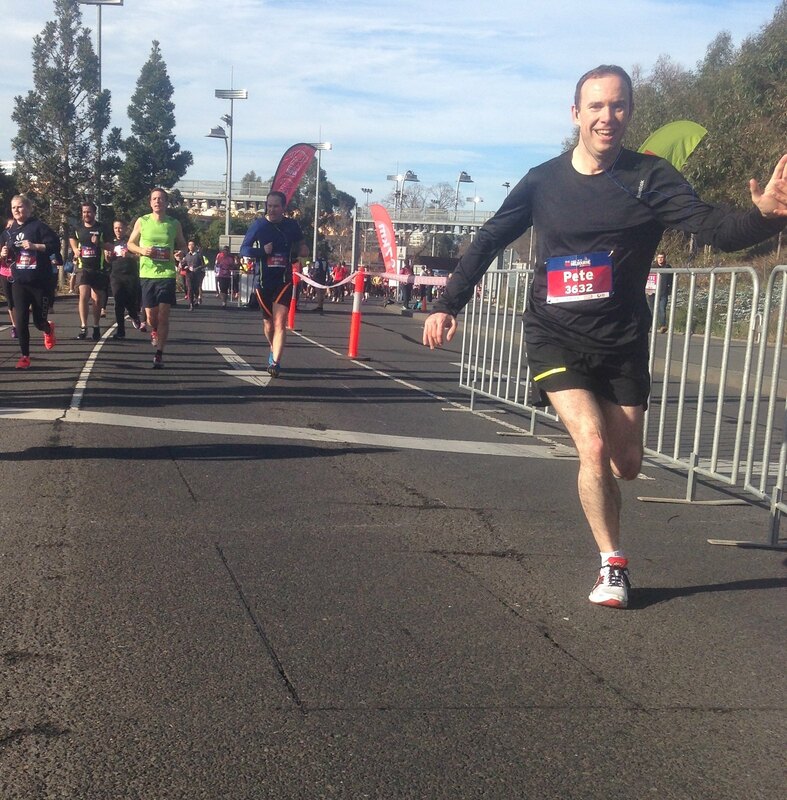 The Run Melbourne 10 km was one of my best runs of the year. It was the first time that I’d managed to run consistently under 6 minutes per kilometre and I finished comfortably in under the hour that I’d targeted. What’s more, I was less tired at the end of this 10 km run than I had been after the 8 km one two months earlier. Here is a photo that Kirsty snapped of me at about 7 km. I actually look like I’m enjoying myself! My running calendar for August, much like June, looks pretty empty. We had a few things going on in our lives outside of running. Not least the arrival of Eamonn’s little brother Dara. I kept up with the parkruns, though and managed to do all five in August. Two of them were interesting. It was a cold morning. Eamonn and his Granny (who’d just arrived from England) came along with me. I brought gloves as my hands had been freezing the previous week. Eamonn decided that he wanted to run with me, so he joined me at the start and ran alongside me until we got back to where Granny was waiting for him, where he went off to play with her. I was still carrying my earphones and couldn’t get them untangled with my gloves on. I decided, despite my earlier vow that I would carry on with them in my hands and not my ears. To my surprise, I wasn’t as wheezy as I had been last time I ran without music. And I didn’t have a cable bobbing around to annoy me. Perhaps this wouldn’t be so bad. I left the earphones at home for this one. Eamonn stayed home, too (the lure of a new baby brother)! Much to my surprise I beat my personal best around Westerfolds Park. Perhaps my music had been holding me back all this time? I’ve not run with music since (and the next parkrun I knocked nearly two minutes off this week’s time). With 10 weeks to go to the City2Sea, the organisers announced a new course… a new fifteen kilometre course. I had signed up for a 14 km event. I’d not run more than 11 km before (and hadn’t run more than 5 km for over a month), it was time to start to think seriously about how I was going to get up to that kind of distance. I was still on paternity leave so managed to squeeze in a couple of runs in the week (with much gratitude to my mother-in-law who was staying to help with Kirsty and the boys) and broke through the 11 km barrier. On the morning I was to return to work, I was awake really, really early. I decided this would be a good opportunity to go for a run and bring myself closer to running 15 km. I had about an hour and a half before I had to get ready for work and decided to use all of it and that’s what I did. That morning I ran 16.5 km, 5 km more than I’d ever run before. I felt pretty good after that, I can tell you! Since I’d stopped using Endomondo, I’d missed the frequent feedback on my pace, distance and time, so I decided to buy a running watch. I took it for its first run at the end of September and it made a huge difference over carrying a phone with me. On my first run with the watch, I ran 18 km. It was a game-changer. I would normally advocate against reading the comments on the Internet, but if you can read the comments on that last run on Strava, do! My friends Gary, Barney, and Cecilia convinced me that I should be upgrading my Melbourne Marathon 10 km entry to a Half Marathon entry based on that run. I really didn’t think I’d be ready for it. That weekend we were in Adelaide for a wedding. It was a good opportunity to do my first tourist parkrun, which was a lot of fun. One of the many things I enjoy about parkrun is the way that you can find one near you almost anywhere in the world. I’ve done four tourist parkruns now and they’ve all been enjoyable experiences. When I got back to Melbourne, it was time for another long run. I decided to see if my friends were right and set off at 06:00 on a Monday morning to see what distance I could cover in two hours. 22.6 km was the answer… I could do a half-marathon… I just did one! I kept a pretty consistent pace too (thanks to the watch). Okay, I would see if I could change my entry. That week I started what was to become a regular arrangement with some of the folks from work who were also in training for the 10 km event, we started to run from the office down to The Tan, around The Tan Track and back again. We still run that course most Wednesdays before work (back then it was Fridays, but we switched). That was the first time that I’d ever run with anybody and it’s made me a better runner for sure. On Sunday, 12 October 2014, having upgraded my entry on the Thursday, I ran the 2014 Melbourne Marathon - Half Marathon in 01:56:31. From a guy who’d not run 100m at the beginning of the year, to run over 21 km at all was pretty surprising. To do it in under two hours was, I think, incredible. The exhaustion from such a long run was certainly surpassed by the sense of achievement of completing a half marathon. The cycle home afterwards was hard work, though! Two weeks later came an even prouder moment… Eamonn took part in his first fun run: 1 km at a much faster pace than I could have managed back in February. He also raised AU$160 for charity. Not bad for a four-year old. I’m not sure that running makes me a better parent, but I hope I’ve set a good example for my boys that exercise is “normal”. I made another weekly running commitment. Commitments to friends are good motivators to get out there, whatever the weather, and run. Fridays are to be “run to work days”. At the beginning of November, as Melbourne was warming up for Summer, I ran into work with another Coburger. It has become a fairly regular thing since then. Unfortunately towards the end of this first run I started to get some pain in my left shin. The next day I ran at Westerfolds parkrun and the pain came back quickly and just didn’t go away. I read up about “RICE”, Rest, Ice, Compression & Elevation. The City2Sea was only 8 days away and I really wanted to get that medal so I did everything in my power to get my leg ready to run the following Sunday. Compression socks are ace (once you get the things on). Kirsty spent most of the following week trying to talk me out of running but I wanted to get that medal! I’d been pain-free for a couple of days when the City2Sea came around, so figured it would be fine to run. It was raining very heavily on the morning of the race, so I drove into the city rather than cycle and start the run wet. I had been worried about how hot it would be in Melbourne in November I shouldn’t have been. I lined up alongside my friends from work and set off at a reasonable pace. I bumped into Gary who asked how my leg was: it was fine and my compression socks seemed to be keeping everything in line. About 4 km in, though, I started to feel it again, a niggling sensation in my left shin. By 9 km as I headed up through Albert Park I was in a World of pain. I wondered about stopping but figured I was closer to the end than the start, so I should get to the end and then stop. I finished in a great time: 01:16:30, which I’m not sure I would have done had it not been for the pain! Unfortunately, the next day I was barely able to walk! I went to a physio and was ordered not to run until the Anterior Tibial Tendinopathy had been treated. And I wanted to do one more run this year! The physio allowed me to ease back into running gently at the beginning of December. I went for a 1 km run with Eamonn to celebrate and was completely pain-free. That Saturday I did a slow return to my home parkrun. Again, pain-free. I’d wanted to run the 10 km Christmas Run at Albert Park, but the physio advised me to stick to 5 km as a limit for now and so I ran my best-ever 5 km at Emma and Tom’s Christmas Run: 0:24:10.3. I did a couple more runs in Australia before heading to the UK for Christmas. On Christmas Eve I did my first ever run on British soil. It was really hard work running in such cold, damp conditions with heavy traffic travelling quickly next to a narrow footpath. I returned to our holiday home feeling that I probably would never have taken up running had I stayed living in the UK. It’s hard to tell, of course. I run in cold, damp conditions in Melbourne! This year I’m running regularly again and building up distances back up gradually to avoid a repeat of last year’s injury. I occasionally get niggles from my left knee but they go away with rest, so I’ll continue to keep them in check. The goal for this year? I have bib number 800 for the Melbourne Marathon! My friend Adrian has helped me form a training plan and now I just have to work through it. Well… a half was a great achievement, but when have I ever done anything by halves?